DXRacer Classic Series ▷ Size & Buying Guide on GOTURBACK.UK! The DXRacer Classic is at the higher end of the DXRacer series. It has less of a racing seat feel than others on the market but still does have an essence of this. It is designed in a way to offer sufficient support when gaming for a long time. Although you won’t find a lumbar support cushion on this model, the backrest is perfectly curved to support the spine. The main frame is crafted from steel which means it’s a very heavy duty and sturdy chair that should last for years. Unlike other models, the Classic has a built in headrest cushion to provide additional support to the neck area. This is a great feature and means that you won’t need to purchase any additional neck support cushions. This is a wide chair which feels a lot more spacious than others on the market. The PU leather covering is well stitched and provides a real sense of style to the look of the chair, making it look much more expensive than it is. It’s a classic chair at a good price with great adjustable features. The DXRacer Classic offers a variety of adjustable features including 4D lockable armrests and a very versatile reclining backrest. It’s a chair for gamers that care about comfort and want something that is going to last them. The best feature of this chair is the option for a sliding leg rest that effortlessly slides out from under the seat. This means that you can recline and put your feet up, which isn’t often seen in other gaming chairs that are available at the moment. The Classic also features an easy to operate gas lift system that allows you to adjust the height of the chair quickly and smoothly. The classic is a bigger chair with a wider back and seat that utilises high-density mould shaping foam that doesn’t become uncomfortable over time. Another great feature of this chair is the multiple pockets built into the back of the backrest which is ideal for storing remote controls or documents. It’s a good chair for larger gamers due to its size and weight limit. The high-quality PU leather means that it is easy to clean and gives it a premium feel. It’s undeniably a great investment for those looking to upgrade from a standard office chair to something that will provide comfort for years. The backrest is fully reclinable, and the armrests also slide back and forward for you to find the most comfortable position. Like other models in the range, the Classic features floor friendly casters incorporated on to a star shaped aluminium base. The biggest thing that makes this chair stand out is the number of customisable options available, meaning gamers can make the chair exactly how they need it. 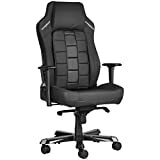 This, teamed with the adjustability of the chair, makes it a fantastic choice for most gamers. 4. The DXRacer Classic comes in five colours, although these aren’t as glamorous as others on the market, they do give a more ‘classic’ feel. Gamers can choose from plain black, red and black, tan and black, white and black, and mustard yellow and black. There are also some great accessories, as mentioned, the leg rest, the chair is available with or without this, and a lumbar pillow. Although the chair does some with a built in neck pillow, those looking for lumber support will need to purchase the lumber pad as an additional extra. Regarding size, the chair is perfect for large gamers. The chair itself is huge and can support a generous 160KG of weight. The optimum height for this chair is between 180 and 190cm but is great for those who are a little taller too.